Meet Barrett Doss, one of only six actresses to receive a 2017 Theatre World Award for an Outstanding Broadway Debut Performance. Doss’ debut as a leading lady on Broadway is her star turn as Rita Hanson in the seven-time Tony nominated musical Groundhog Day, now continuing its successful run at the August Wilson Theatre. Doss plays opposite of the award-winning actor, Andy Karl. Groundhog Day the Musical made its world premiere in 2016 at the Old Vic Theatre in London. The musical received eight 2017 Laurence Olivier Award nominations and won for Best New Musical and Best Actor in a Musical for Karl. The show is an adaptation of the 1993 film comedy that starred Bill Murray and Andie MacDowell. The movie is listed among one of the best comedies ever, grossing more than $70 million domestically. 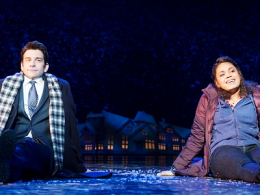 Nominated also for a 2017 Tony Award for Best Musical, the cast of Groundhog Day performed the musical’s closing song, “Seeing You,” at the awards telecast back in June. Doss recalls the experience as an emotional roller coaster because she had the opportunity to perform in front of all her idols while representing the show. Groundhog Day is a musical comedy centered on Phil Connors, an arrogant and obnoxious TV weatherman, played by Andy Karl, who is assigned to cover the Groundhog Day event in Punxsutawney, Pennsylvania. He somehow finds himself in a time loop, repeating the same day over and over again. Rita Hanson is the new producer assigned to his broadcast team and later becomes Connors’ love interest. In Groundhog Day, Doss plays Rita, a 36 year-old, intelligent, self-aware woman who has a great deal of compassion and love for life. In the context of the show, she goes through the journey of finding herself. She has accepted the fact that she may never find the right romantic partner and has settled into that reality. By the end of the show, she has shifted her position to the point where she has reopened herself to the possibility of a romance with Connors. As a black woman cast in that role, Doss wanted to be mindful and sensitive to the authenticity and the representation of the character. “I’m glad that they chose me to play this role,” says Doss, who made her Broadway debut as an understudy for multiple roles in the revival of You Can’t Take It With You. Doss initially auditioned for a lesser role, Nancy Taylor, for Groundhog Day, but when she received a call back, it was for the role of Rita Hanson. Between the time she went for the call back for the Rita role, she had another audition and call back for a television opportunity, a recurring role on Iron Fist on Netflix which she ultimately booked. It was Doss’ first recurring role for television and one she felt she could not turn down. Though Doss had high hopes of starring in the role, she was thrilled when she received a final call back later in the year when the musical was headed to Broadway. The decision was made to cast an American for the role of Rita. Born in Minneapolis to a Caucasian mother and an African American father, Doss moved around as a kid. The family first lived in Albuquerque, New Mexico, for two years; she then spent most of her childhood in Chicago, and later moved to New York City, where she completed her last two years of high school at the Professional Children’s School (PCS). Doss was introduced to musical theater as a kid when she spent four years as a member of the popular Chicago Children’s Choir. In middle school, she auditioned for her first stage musical through its theater program at the University of Chicago Lab School. It was during that time that she felt in love with acting and with the idea of embodying another person’s spirit on stage. She became invested and participated in theater-focused and musical theater programs around the city. She later worked with Janet Louer, a private acting coach in Chicago, who was a big believer in Doss’ talent and abilities. Louer, whom Doss says was one of her most demanding teachers, felt that she could have a professional career in the performing arts, and continuously inspired, encouraged and pushed her out of her comfort zone. Though Doss hasn’t spoken with Louer in more than ten years, she says she would like to reconnect with her and perhaps invite her to see Groundhog Day. Raised in a blended and non-traditional family environment. Her parents divorced when she was a kid, and Doss lived with her mother, Kelly Skalicky, who later married her longtime partner, Veronica, who shared parenting responsibilities. Her father, Karl Doss, remarried and relocated to Virginia with his new family. Doss has three half-siblings from that union, an 18-year-old brother and two sisters, 16 and 12. Doss credits her family for keeping her spiritually centered and grounded. Doss’ mom has always been her biggest champion. Her mother made it possible for her to be in New York and live her dream. Her mother moved the family from Chicago to New York when she was in high school. One of her teachers believed that Doss had what it took to be a career actor and recommended that she go to New York to study and develop her craft. Though her mom had a strong hand in raising her and formed her as a human being, in many ways, Doss feels like she’s more like her dad at her core. Her father has always made her feel comfortable about loving herself and embracing her idiosyncrasies, which at times made her feel like she didn’t fit in and belong. She look to her dad for confidence building. He taught her how to walk out into the world and be exactly who she wanted to be. Recently, Doss’ grandmother Mae Skalicky passed away, five days before the opening of Groundhog Day. It was extremely difficult for her to process that loss. Luckily her grandmother’s remembrance service was scheduled on her day off. Though it was a sad occasion, she did get the opportunity to reconnect with her family and her grandmother’s friends, which provided her with some much needed strength and comfort. Doss’ boyfriend, Austin Durant is another source of inspiration for her. Also, an actor, he was recently seen in the Public Theater’s Shakespeare in the Park production of Midsummer Night’s Dream. Doss and Durant spend a lot of time cooking and discovering new restaurants around the city. Growing up as a biracial child, Doss didn’t grow up in a diverse environment; she attended private schools with mostly white children. She admits that in many ways she was sometimes confused about her identity. Her struggle was compounded by the fact that her mom is a lesbian. It did take her a long time to get comfortable and appreciate and like who she was. Doss recalls an incident with a school girl, who became angry and threatened to tell everybody that her mom was gay. That was the first time that it crossed her mind that maybe she should hide the fact that her mother was gay, but even after that revelation she never wanted to hide it. But doubt and insecurity lingered in her mind, and she constantly questioned herself. After 12 years of living in New York City, the Brooklyn-dweller now considers it home. She counts many of her friends as mentors and an important part of her nucleus of support and is grateful for the relationships she has established over the years. Doss has had the good fortune of training with Joan Lader, a master voice instructor. She understudied for actresses Rose Byrne, Annaleigh Ashford, and Crystal Dickinson in You Can’t Take It with You; and at 16, she worked with Steve Lutvak, who was her rep coach and helped her with auditions. Lutvak wrote the music and lyrics to the Broadway musical Gentleman’s Guide to Love and Murder. 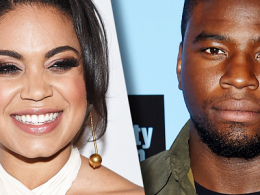 Out of the landscape of Broadway greats, Doss has a special affinity for six-time Tony Award winner Audra McDonald, who is one of her biggest inspirations. 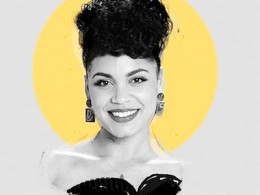 Doss first saw Ragtime as a kid growing up in Chicago, and the show remains one of her all-time favorites, and the primary reason she wanted to be an actor. Though she never saw McDonald in a production of Ragtime, she played the original cast recording featuring McDonald endlessly. Going forward, Doss would like to become a recording artist and composer, creating original music, though she doesn’t play any instruments. She is a lyricist and would like to collaborate with producers and other songwriting partners, and plans to develop her talents in that area. Also on her dream bucket list is a role in an August Wilson play, and to star as Cathy Haitt in Jason Robert Brown’s two-hander play The Last Five Years. Doss recognizes that some people wouldn’t necessarily see Cathy cast as a black woman. She has worked on that music for most of her adult life and would love the opportunity to play that role before she’s too old.